Ball Lightning Power & Propulsion! Electron Power Systems™ founded by the discoverer and owner of its patents, Clint Seward is a variation on the spheromak idea arising from the observation of ball lightning. The proposed fuel is hydrogen and boron to produce aneutronic fusion. As envisioned by Clint Seward it should be able to be incorporated into small units that could power spacecraft and even cars. The propulsion units are therefore anticipated as being quite small - at least small enough to fit in cars. There is history of prior technology based on a similar idea. In the 1970s Dr Daniel Wells, who had been working on the stellarator at Princeton Plasma Physics Laboratories in the 1960s, began work on the TRISOPS project. TRISOPS, standing for Thermonuclear Reactor In Support Of Project Sherwood, involved a couple of effective plasma guns. It used a theta pinch (θ-pinch), different from the z-pinch in the way the magnetic fields are oriented to the plasma. The θ-pinch involves passing an electrical current around the plasma causing a central magnetic field. It produces a relatively stable plasma. By pulsing the current around plasmas at each end of a pryex tube, the two plasmas are heated and accelerated toward each other through the tube as if from two guns. The collision force increases the chance for nuclear fusion-type reactions. Based at the University of Miami and funded by the National Science Foundation and Florida Power and Light, work ceased in 1978 when further funding was stopped. The apparatus remained in Miami until 1997 when it was shifted to Lanham, Maryland to be assembled for the CMTX (Colliding Micro-Tori eXperiment) project. The investigators associated with it were J E Brandenburg, John F Kline and V R Dipietro. Very little information is available on developments from this project. Presumably nothing significant has eventuated. Ball lightning, the basis of the idea for Electron Power Systems™ underlying idea, can be observed in nature as a relatively stable collection of plasma slowly moving through the air. Below is a demonstration of the effect as recorded in Saudi Arabia after lightning struck power lines. The basis of it is proposed to be a cloud to earth electrical discharge ionising the air it passes through. 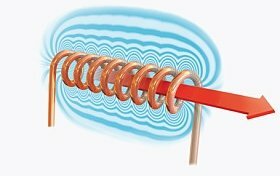 The current creates its surrounding magnetic field which causes the ions and electrons to arrange around each other in a relatively long-lasting free-standing torus shape. Or, in slightly more detail, by creating a strong current around the fuel in the system, magnetic fields develop about it as the plasma heats and is impelled forwards. As it progresses from the site of the initial current it folds in on itself creating its own doughnut toroidal shape. In his patents begining from 1986 Clint Seward observes that his generated plasma toroids last for 200 milliseconds (a fifth of a second) - much longer than the microseconds (or 5 milliseconds with SSPX) the spheromak toroid lasts. The Electron Power Systems™ apparatus is known as an Electron Spiral Toroid Spheromak (ESTS), or at times as an abbreviated name of Electron Spiral Toroid (EST). The aim, like the TRISOPS idea, is to create two of these plasma toroids accelerated toward each other to induce fusion as the two heated plasmas collide. Image of Electron Spiral Toroid courtesy of Focus Fusion. The plasma toroids have a central core of positively charged ions with a surrounding cloud of negatively charged electrons. Clint Seward has produced images of these generated toroids. There have been explanations of such a system being created in regular atmospheric conditions, as well as in a relative vaccuum of a thousandth of atmospheric pressure. The greatest amount of information about the project is on a hosted website for Electron Power Systems™. A NASA report around 2000 discounted the Electron Power Systems idea as being possible. Clint Seward replied to the points raised, defending the idea. Even in a 2010 interview, Clint Seward was still discussing his ideas as a means of propulsion. He has been seeking $2 million to conduct an initial development to a demonstration unit over around eighteen months. He expected the Electron Power Systems™ idea would then require a further $8 million to produce the prototype. As far as being scalable from propulsion of cars through to spacecraft right on to alternative energy production Electron Power Systems™ looks like an interesting idea. Utilising pulsed energy production with some inherent stabilities in the activated plasma, it has appeal with in not requiring intense confinement. Using boron and hydrogen for non-radioactivity-producing aneutronic nuclear fusion it is even more interesting. At present though there is little ongoing information available about progress with Electron Power Systems'™ idea. Clint Seward has recently communicated there are further developments occurring. He has produced larger plasma balls up to just under 8cm (over 3 inches) in diameter lasting for times closer to one second. Ambient pressures to half an atmosphere have been used. It looks likely normal atmospheric pressure could be used. The ion density is approaching 1019 ions/cm3. This is compared to tokamak ion density of 1015/cm3. The increased density allows for more ion interactions. Following this success Electron Power Systems conducted a crowd funding exercise to secure further finance. Details of the recent breakthrough were submitted in January 2013 and published on February 26, 2014. Copies of the paper can be downloaded from the company's website at the products page.